Today’s extra special group of ticket scans was kindly donated by Gorilla’s Don’t Blog, thanks Major!! 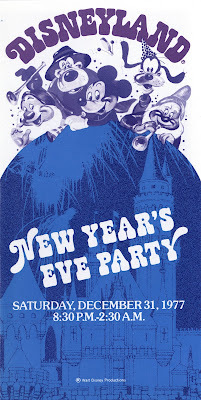 From Saturday December 31, 1966 here’s an ultra low serial number ticket for the Gala Party. 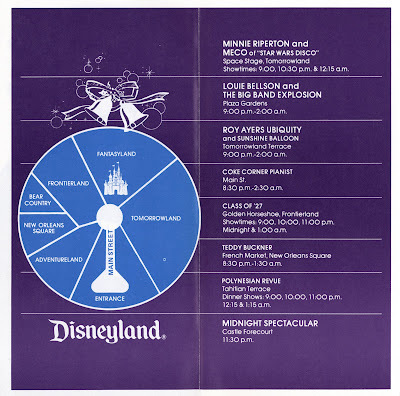 “Hats & Noisemakers” included with the unlimited use of all Adventures and Attractions. 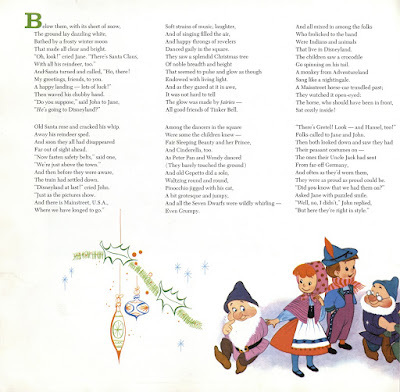 Sunday December 31, 1967 was the date these fun characters are dancing with such excitement about. They sure are fun to look at, I love that art work. 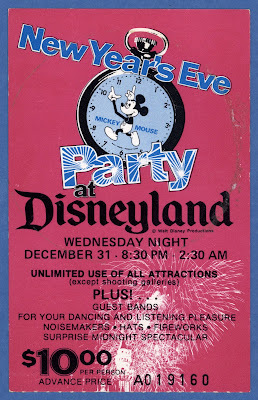 “Crazy New Year’s Hats” for this year, "Surprise Midnight Spectacular", and of course “unlimited use of all Disneyland attractions”. The pink version was for “advance sale” and cost $9.00. Thank you Major for these and the other fine contributions you have donated over the past year, they are much appreciated. Happy New Year Everyone, Have a Fun and Safe night! Bonus Sunday - "The Disney World"
Welcome to the first Bonus Sunday of 2010! 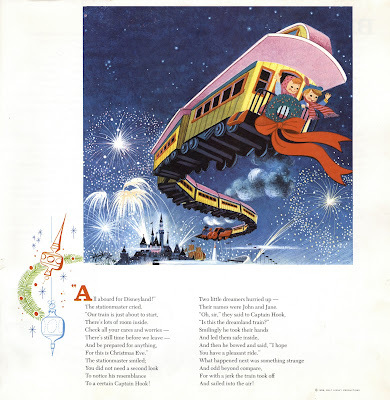 Here's the complete issue of "The Disney World" December 1965 - January 1966, there sure was a lot going with the Disney Company heading into 1966. 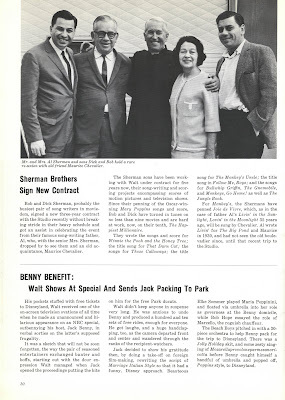 The Sherman Brothers sign on for three more years, nice! 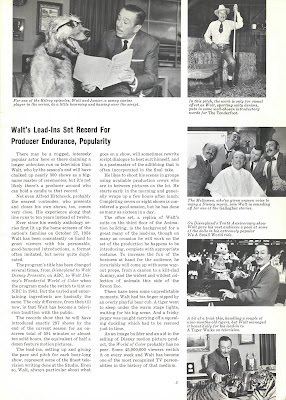 “Benny Benefit” is a great article about a hilarious appearance Walt makes on Jack Benny’s TV Special. 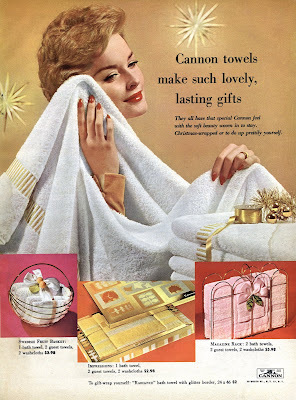 It just so happens you can download the entire November 13, 1965 Jack Benny show (including awesome Eastern Airlines commercials) at archive.org (link). 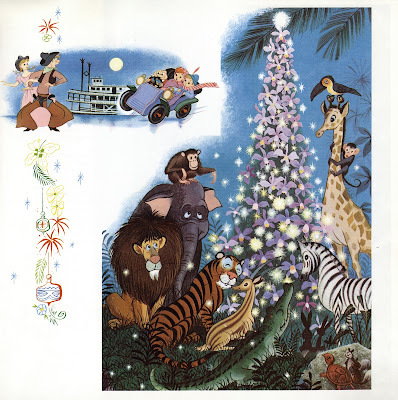 I clipped out the scene that featured Walt and posted it below (hope it worked..). I love that the whole setup is about free DISNEYLAND TICKETS and we get to see one hundred and eleven ticket books. Walt definitely plays into Benny’s style of humor, it’s great to see film of Walt that I've never seen before. 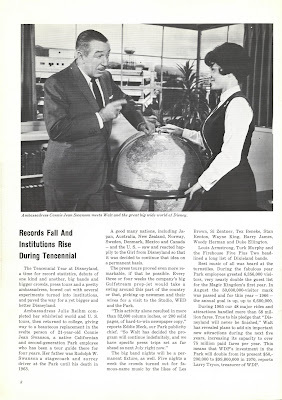 More photo’s of Walt, he sure was a busy man. 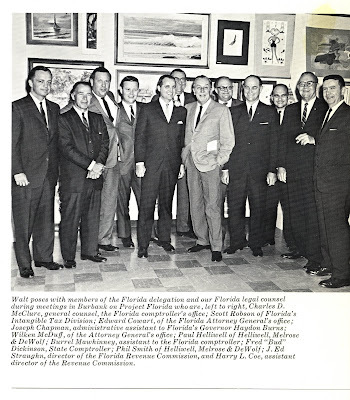 Here’s Walt with the Florida Mafia. Neato painting on the wall of the back side of a beach lady! 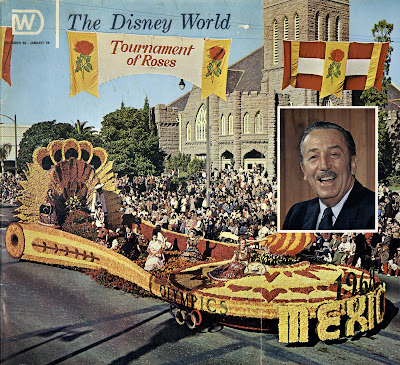 Walt was more popular than ever leading into 1966 and the company knew it. 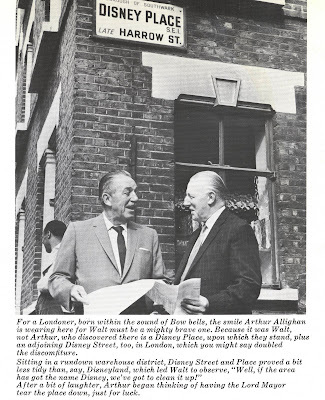 It really is difficult to image where the company would have gone had Walt been around for a few more years. 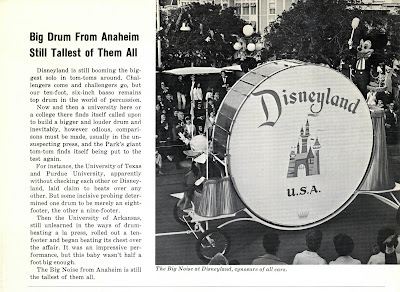 That is one BIG drum! I'd love to hear it Where is it now??? There’s only three days to the New Year? How did that happen so quickly? That must mean it’s time for “New Year’s at Disneyland”. 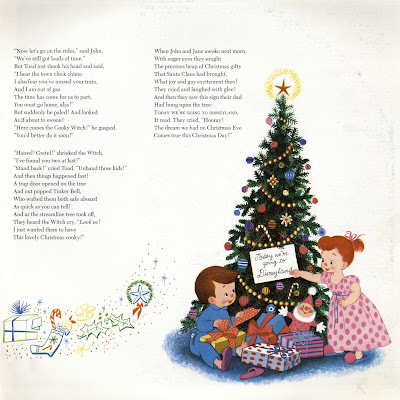 December 31, 1981. Mickey and Minnie look ready to celebrate the New Year in style! The Manhattan Transfer!!! Boy was I a fool not to attend on this occasion. I love The Manhattan Transfer; I still play my 45 of Manhattan Transfer’s “Twilight Zone” from 1979. You can buy the song for a penny here (link). Kool & the Gang at the Space Stage in Tomorrowland most likely singing their 1980 hit Celebration, wow this was quite a night! 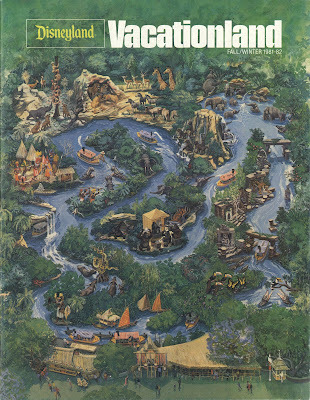 This post needs some color so here’s the cover to the Fall/Winter 1981-82 Vacationland. 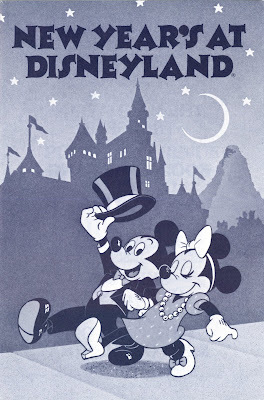 This is one of my favorite “modern” era Vacationland covers, Charles Boyer had a unique and vibrant way of capturing the Disneyland Spirit. 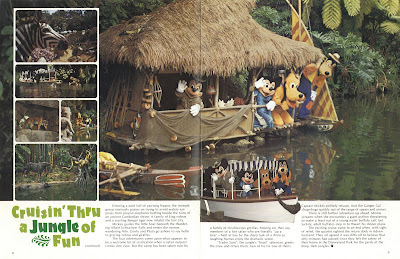 The whole gang is aboard; I always wondered if that Hut thing on stilts can support people, I guess it can. 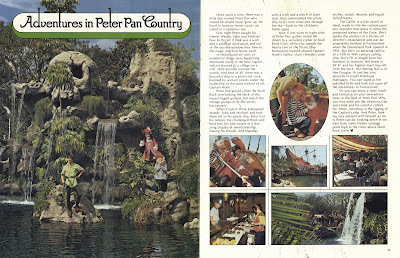 “Adventures in Peter Pan Country” Better catch those adventures while you can, this whole area, ship, skull and all, will be gone in less than a year (link). It’s New Year’s Eve at Disneyland, presented by your local Pepsi-Cola Bottler. 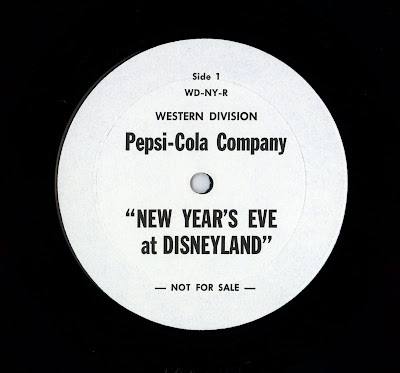 This LP was produced by Pepsi for Radio Station use. It’s also (scream it with me) “undated” but I would place it at 1967 based on, among other things, a mention of "Sunday" as New Year's Eve. 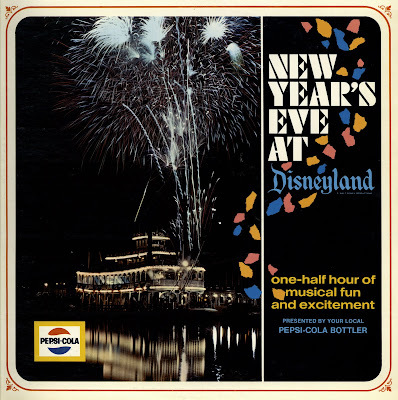 Be sure to download both sides of the LP and play it as you celebrate tonight, its one-half hour of musical fun and excitement. The LP is devoid of any actual information of what’s on the record itself. 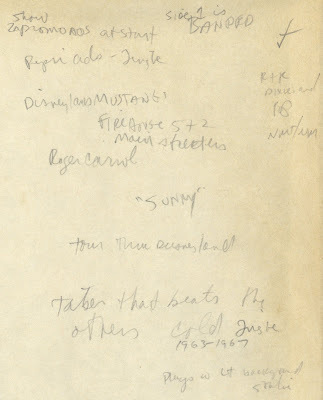 This was hand written on the inner sleeve. Side two is the better of the two sides, starts with Pirates (in their “Pirates Lair”!) moves on to some great Firehouse 5 plus 2 tunes, then some super Golden Horseshoe singing. My copy of this LP is blank on the back cover, but there's a copy for sale on Ebay right now (link) that has this information on the back cover. I suppose if you work in radio this makes sense. Help ring in 1972 with “New Year’s Eve at Disneyland”, Friday Night, December 31, 1971. That’s some interesting artwork on this ticket; those little dancing people art great! 8:30 PM to 2:30 AM – nice! 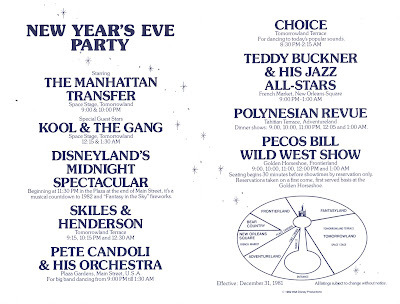 Guest Bands, “Surprise Midnite Spectacular” what was that? 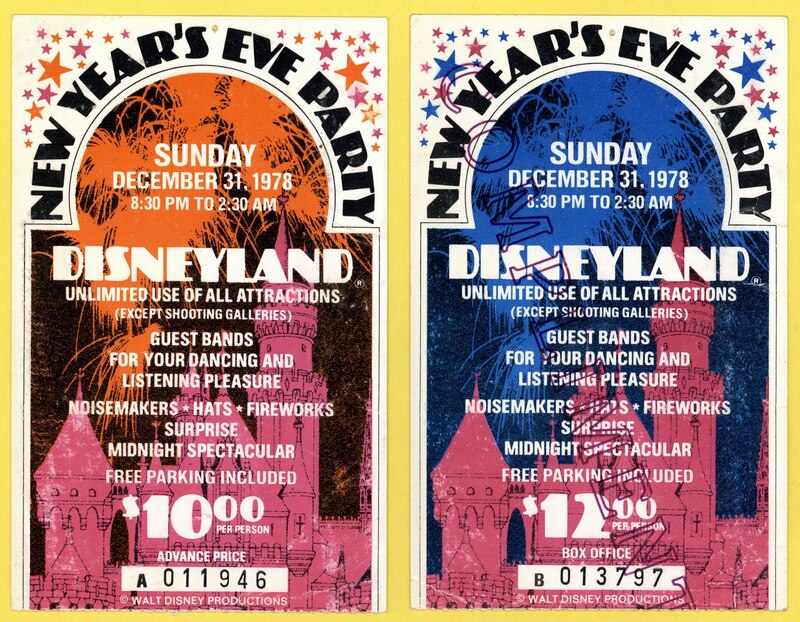 At $9.00 this ticket was higher than any “ticket books” of the time, but these are for UNLIMITED USE of all attractions (except shooting galleries). 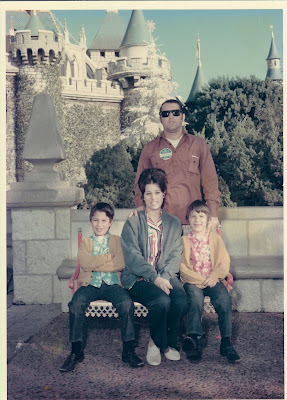 Since we’re in 1972, let’s visit the “Jones” family on a June 1972 visit to Disneyland. First up the obligatory castle shot, those ladies have at least 25 pounds of purse each and I think the eldest son is holding a ticket book! 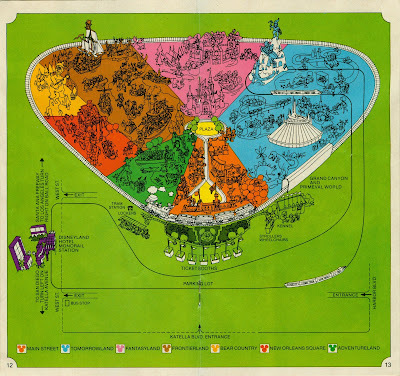 This one is labeled “Disneyland” in case you weren’t sure where this was. 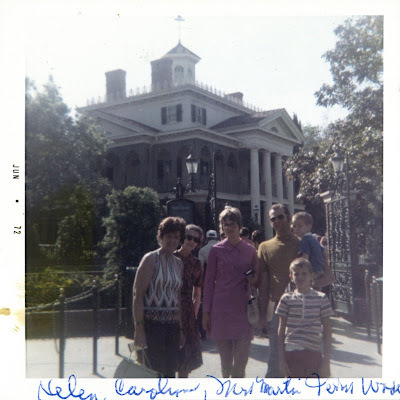 Here we find the motley crew in front of the fairly new Haunted Mansion. I am really digging these clothes. How about some Vintage Tomorrowland? 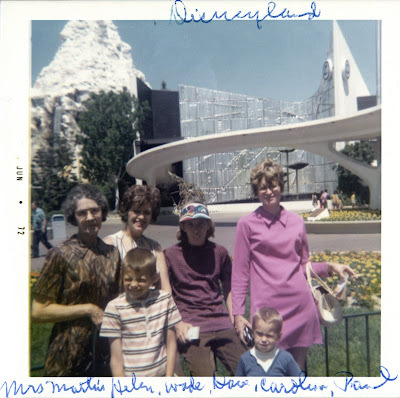 Why did the “Jones” family bring along Mrs. Martin their school teacher? Multiple "ticket book in hand" sightings – Purple dress lady is smoking and holding, talented babe. I miss the Bell Logo’s on the entrance facade. 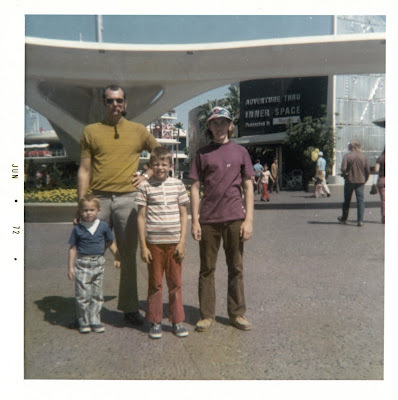 A nice clear shot of the Adventure Thru Inner Space sign and how cool is that proud dad smoking his pipe with his shades on? Memo to the smallest son, Lost in Space wants its shirt back. Middle kid; gets some shades like your dad, you’re always squinting! Purple dress lady must be mom? 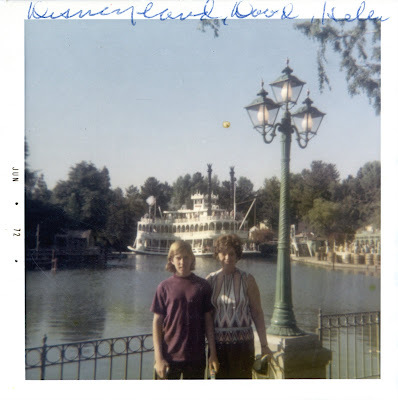 I remember those benches along the lagoon, what color and version monorail is that? Vintage fence alert! And lastly a ho-hum photo of the Mine Train, the family looks happy, obviously not knowing the attraction would close in four short years. 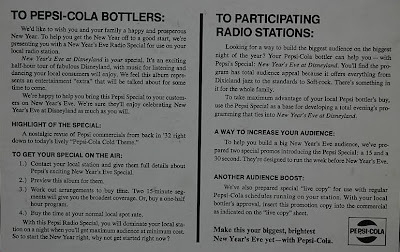 We've got a bunch of New Year's at Disneyland tickets for your review today. Happy New Year Everyone! First up is this GIANT Disneyland Team 2000 commemorative passport just barely breaks my "if it starts with a 19 its vintage" rule, but just by one day! Here's the ticket in its envelope, can you tell whats inside? This ticket is unnecessarily huge measuring in at 13 3/4" by 4". I'm convinced they made them in these giant sizes so that you'd be embarrassed to use them! When I first got this ticket I thought "Wow, Cynthia Harriss signed it" but upon closer inspection her signature appears to be printed on the ticket. Here's the big question, would this ticket be worth more or less if she actually signed it? 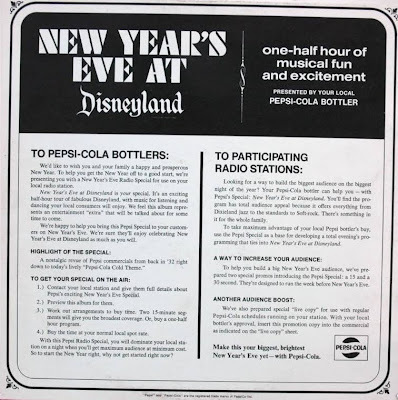 Now lets go back to 1975 - a Mickey Mouse Watch and a cool fireworks silhouette. 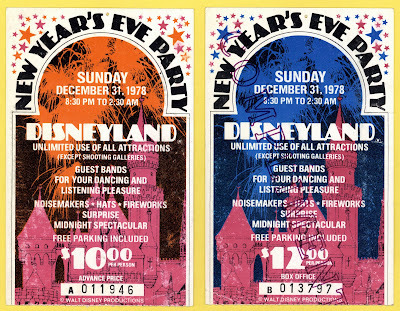 From 1978, this pair of tickets shows it saves (2 bucks) to purchase tickets in advance! Minnie Riperton and MECO of "Star Wars Disco" - Sweet! 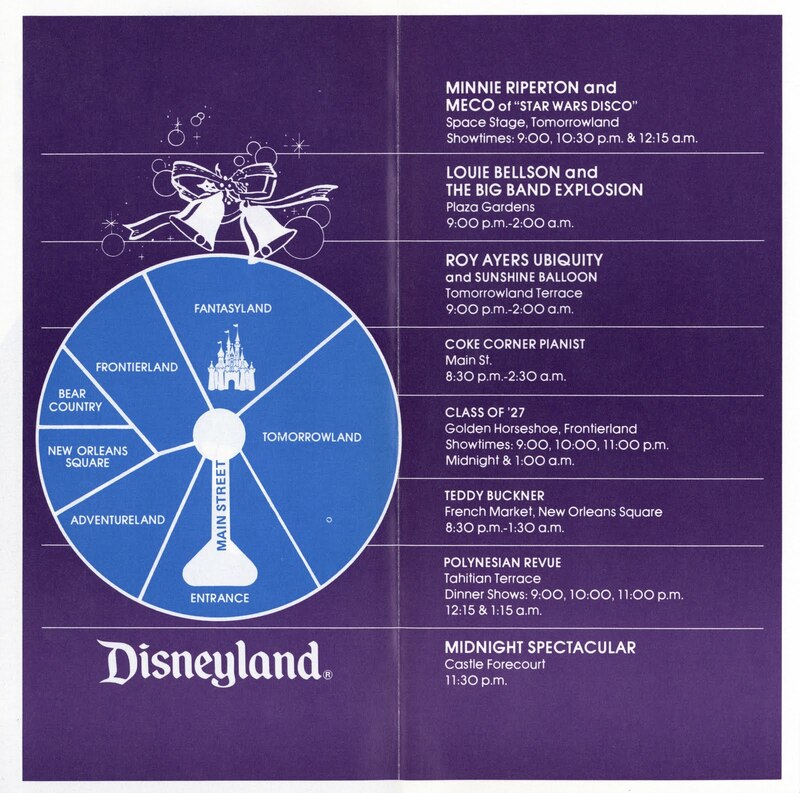 Now for your guide book to match the season, here's the Fall/Winter 1977(78) Disneyland Guide Book. No waiting for Bonus Sunday for the complete guide, it was posted a while back, here's the link. 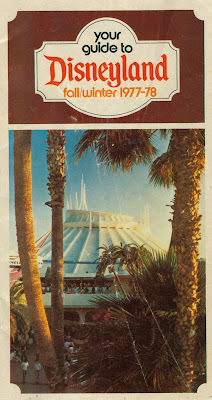 The brand new Space Mountain on the cover, while the large palm trees in Tomorrowland look nice, I never understood how they fit the futuristic theme? 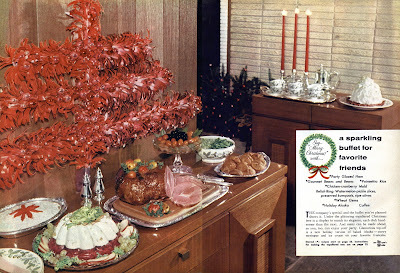 Merry Christmas and Happy Holidays to all the wonderful readers of my blog. 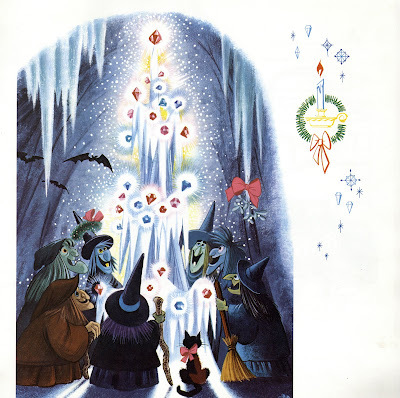 I hope this holiday finds you safe and well, and in good cheer. As many times as I've been to Disneyland growing up and as big of a fan that I am, you’d think there would be lots of photos of me at the park. 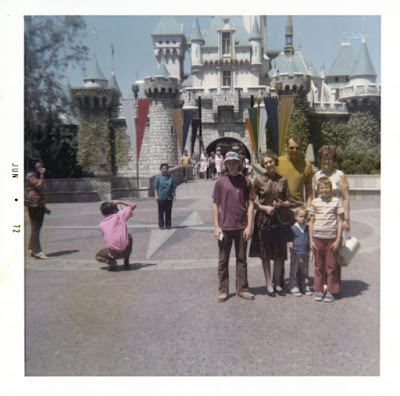 My parents have dozens of photo albums from my childhood but there is only one photo of me at Disneyland. 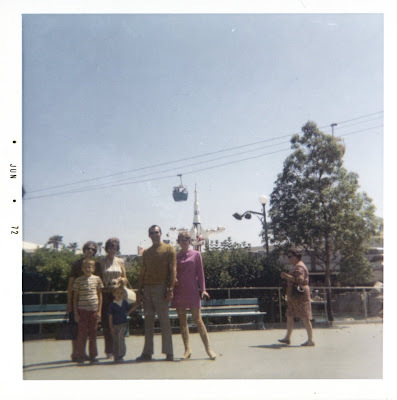 Here is that one photo, me and my family at Disneyland - December 1970. My dad looking every bit the part of his job as Plumbers/Contractors Union Boss, my mom looking pretty hip considering she is only 25 and had to deal with me and my brother constantly trying to kill each other. My older brother is on the left and the silly little kid on the right is yours truly… Blame dad for the hair cut and mom for the clothes. 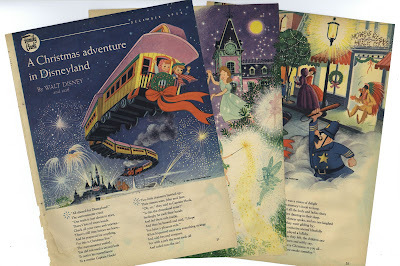 Werner Weiss’ great site “Yesterland” recently ran a fun vintage Disneyland Christmas update (link) where he posted this photo below. 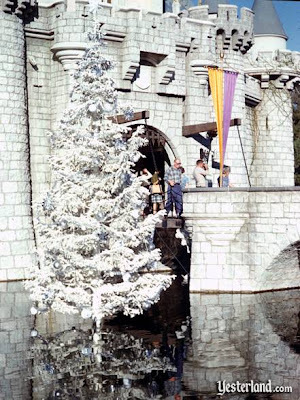 It looks like the same type of white Christmas tree as in my picture above. Thanks Werner! Welcome to Magazine Monday. 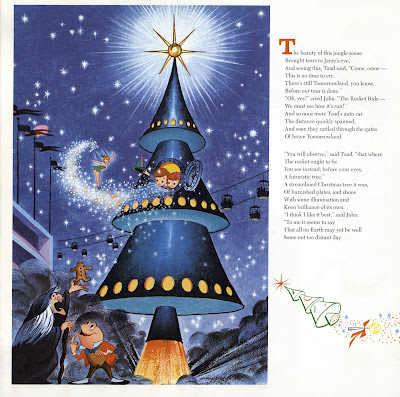 Today is a special Holiday edition of Magazine Monday that includes a fun alternate look at a vintage magazine that features Disneyland. 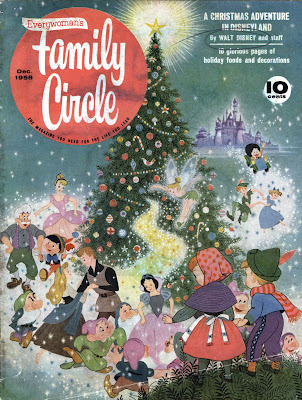 From December 1958 we’ve got Family Circle Magazine. 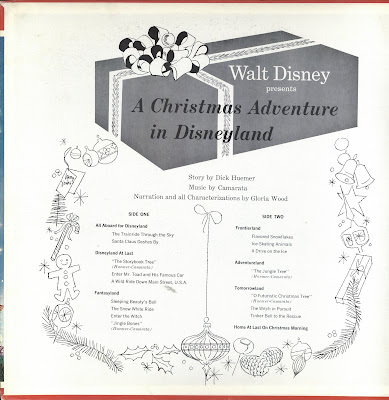 This issue features the tale of “A Christmas Adventure in Disneyland”. 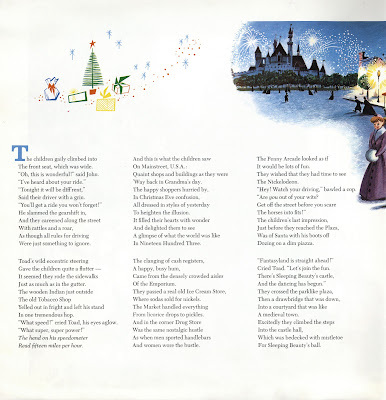 The Disneyland story covers eleven pages and has poems and song lyrics accompanying it. As you can see my copy of this Magazine is not only old and faded, but appears to have some decent water damage as well. 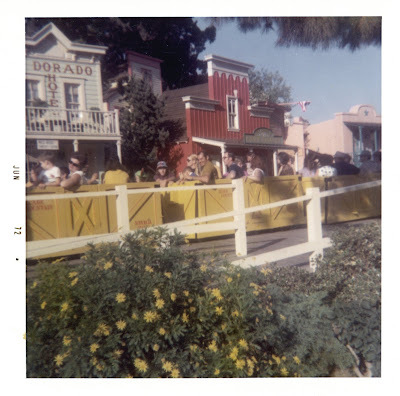 And naturally the Disneyland article has the worse damage! 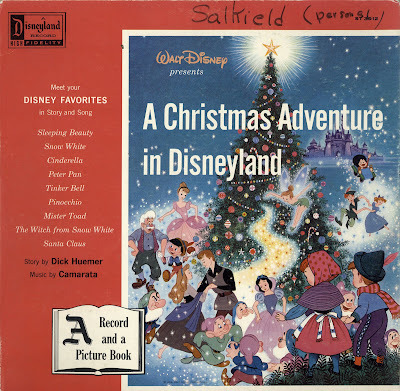 Rather than present dull, faded, stained pages, I just so happen to have the same story as told via a 1958 Disneyland Record. This grand LP included a full size booklet in between the covers and has held up remarkably well for 51 years. The inside cover describes what’s on the record. 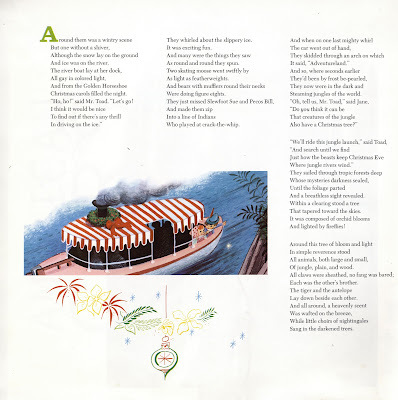 How about listening to the record as you follow along reading the story? I recorded each side of the LP, the files are below. No video this time, I discovered you get much better sound quality when you connect the stereo directly to the computer. That said, this record is 51 years old and has its share of pops & scratches. 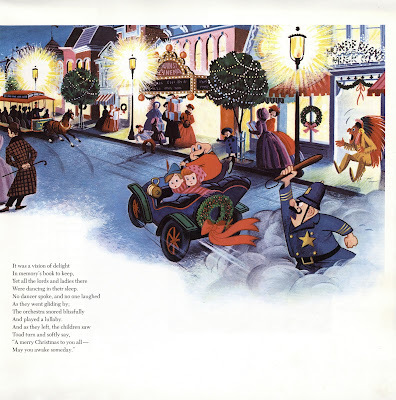 The narration is a bit annoying, with the worse Mr. Toad impression I’ve ever heard. However, the record is fun to listen to. 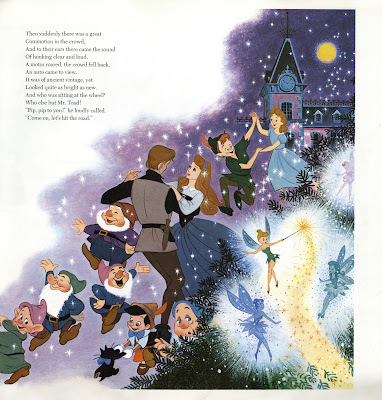 You MUST check out the song “Jingle Bones” at 10:30 on side one, classic late ‘50’s Disney at its best. The 11 pages of the story are below. 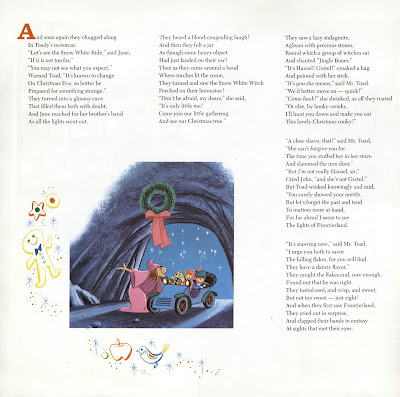 They are posted without interruption, my only comments are; WOW – amazing artwork and Gee- what a neat story. Merry Christmas! 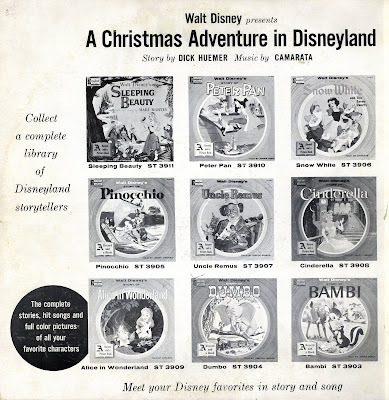 Some of the other “Story Teller” series of Disneyland Records available in 1958. I have few of these, most are fairly rare including this one. Now back to the magazine. 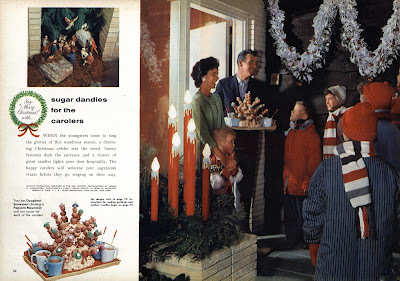 These sets of pages represent all things Christmas in 1958. Each of these five articles is spread over two pages. I did a decent job of stitching them together but you will notice color variations on each of the two pages. It appears to have been printed that way or half the pages faded more than the other half. 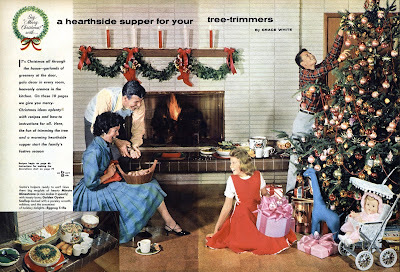 A hearthside supper for your tree-trimmers. 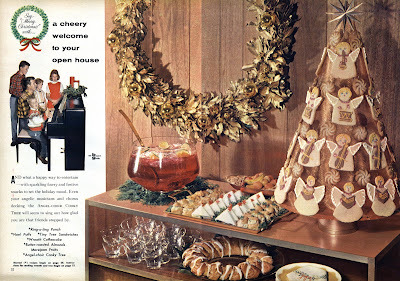 A cheery welcome – check out that snack cart, yummy! 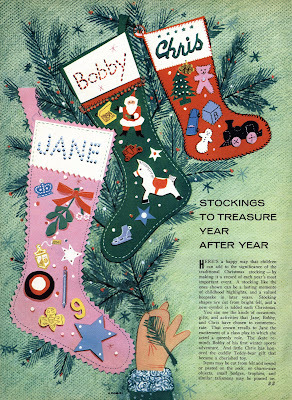 "Stockings to treasure” – paging Kevin Kidney. 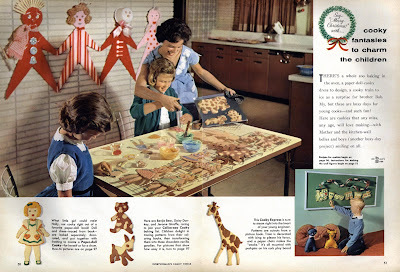 How about some vintage holiday time advertisements? 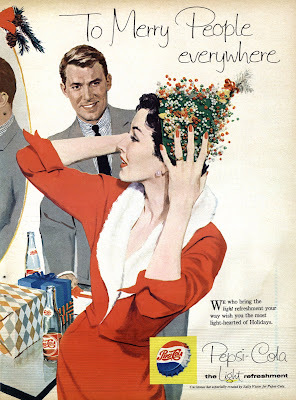 Up first a classy lady for Pepsi, nice hat – especially created by Sally Victor for Pepsi. 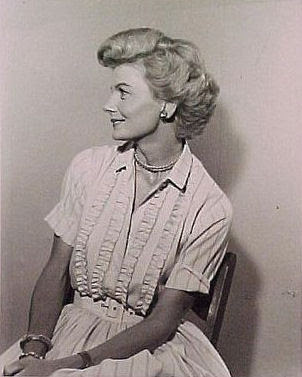 This lady must be related to Barbara Billingsly? 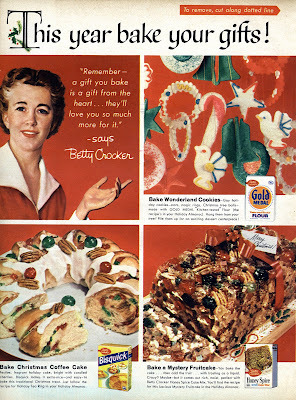 Bake a “Mystery Fruitcake” from Betty Crocker. Aren’t all Fruitcakes mysteries? 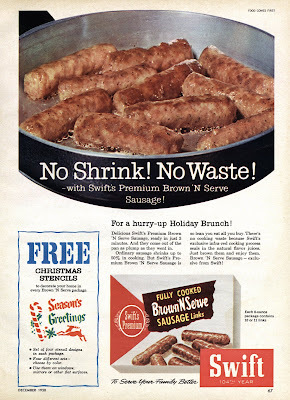 “No shrink, no waste” precooked sausage from Disneyland sponsor Swift Meats. 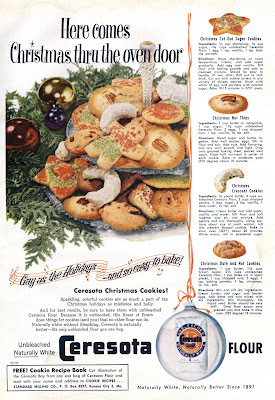 More Christmas cookies with recipes, this time from Ceresota Flour (unbleached – naturally white). Have you ever heard of “Ceresota Flour”, I sure haven’t. 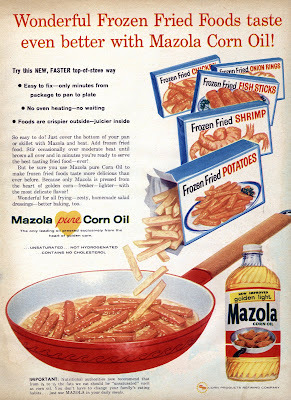 Mazola was way ahead of the health food curve, promoting corn oil as more heather than regular oil (lard). I hope you enjoyed this little Christmas treat. The Wonderful World of Wizardry December 19? ?